You look at your pet’s ears and notice there is a dark, waxy substance in their ear canal. After doing some research, you realize your pet probably has ear mites. Now what? If you’ve found yourself in this situation lately, we’re here to help. Here are our answers to common questions about ear mites. Ear mites are tiny, spider-like creatures that invade the ear canal of dogs or cats and feed on skin debris. Ear mites infect cats more frequently, but dogs are not immune. Puppies, younger dogs, and dogs with allergies or a weakened immune system are more susceptible to ear mites than the average dog. A dark, waxy substance in your pet’s ears (pictured right) is one of the most common indicators of ear mites. How do I treat ear mites? Treating ear mites requires persistence. Ear mites are contagious, so you must treat all animals in the family simultaneously. You should also warn friends whose pets might be exposed to your infected pet during play time. The first step in treating ear mites is cleaning the ear. Cleaning out the waxy substance ear mites create allows treatment drops to be more effective. We recommend starting with an alcohol-free ear wash, like All Ears Wash. Use this wash on a daily basis until all signs of ear mites are gone, then use the wash one to two times a month as a preventative measure. Contrary to popular belief, rubbing alcohol does not alleviate ear problems. Alcohol dries out the ear and can sting, causing more pain inside an already sensitive ear. We recommend considering gentle, natural, alcohol-free options. After washing your pet’s ears, wait a few minutes, then apply ear mite treatment drops like All Ears Treatment. These treatment drops alleviate your pet’s infection and pain by suffocating the ear mites. Apply drops one to two times per day, for five to seven days. Prescription chemical ear drops require a two week treatment period, but cedar-based drops work in half the time! How do I apply Ear Mites Treatment? When applying ear wash solution or ear mite treatment, use calm, confident movements. Use one hand to hold your dog’s or cat’s head to one side, keeping the ear open so you can see into it. Using the opposite hand, dispense the drops into the ear canal. Gently massage the base of your pet’s ear. Massaging promotes the movement of the solution throughout the ear canal and helps to ensure complete coverage of the inner ear. Repeat this process on your pet’s other ear. Apply drops one to two times per day, for five to seven days. A dog or cat will almost always shake their head after treatment, so consider having a cloth or paper towel nearby to wipe off the excess. 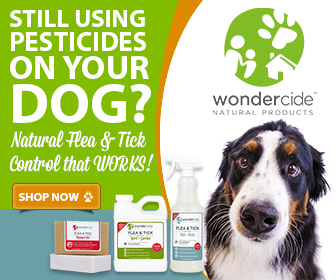 How can I prevent future ear mite infections? Prevention is the best way to maintain your pet’s ear health. Inspecting and cleaning the ears once a week is the best way to prevent ear mites or other ear problems. Do not use cotton-tipped applicators (like Q-tips) in the animal’s ear, as these may only push debris further into the ear canal or cause injury. Instead, use cotton swabs or pads soaked in All Ears Wash to clean the ear on a weekly basis. This wash keeps ears clean and maintains a healthy PH balance, which prevents future ear mites. Ear mites are like ticks and are tiny spider relatives. The best treatment for both ticks and ear mites is diatomaceous earth, a non toxic natural product of earth generated from fossil remains. All insect/arachnid species are killed by it and they cannot become immune to it as it is a nature made, long lasting NON chemical insecticide that is just a simple DIRT! Olive oil is one of the best ways to treat ear mites in cats. This is due to the presence of two active compounds named oleocanthal & squalene, which are known to have antioxidant as well as anti-inflammatory properties. Hi to all, as I am truly eager of reading this web site’s post to be updated on a regular basis. 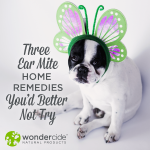 Ear mites are certainly cringe-worthy, which is why we make an excellent, natural Ear Mite Treatment!